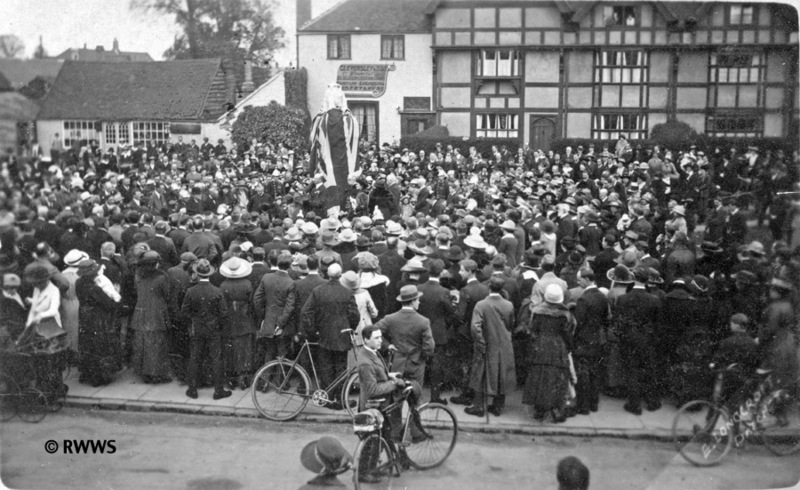 In 1919 it was decided to erect a War Memorial in the village. An attempt was made to compile a War Roll of every man (and woman) who had served as well as those who had been killed in action. Villagers were asked to complete a form providing relevant names and details. The memorial which cost just over £600 was paid for by public subscription but families did not have to pay to have the names of their loved ones recorded on the memorial. It was originally intended that the War Roll should list the names of all those whose home was in Datchet when they joined up. It was also stipulated that married sons living elsewhere should not be included. It can’t have been an easy task to collect the names. Some men’s families had left the village, some had never had family here, and some families may have been unhappy with the exclusions. It would have been hard to explain to a grieving parent that their son – who had been born and brought up in the village, perhaps spending the first 20 or more years of his life here, with friends and family still here – could not be remembered on the memorial because he had recently married and moved away. In the end, the compilation of a definitive War Roll was abandoned. The incomplete War Roll records the names of 350 men, including some who weren’t living here when they enlisted, and others who had married and moved away. It lists the names of 52 men who died but two of these men are not remembered on the Memorial; Henry Davis and Alexander Brown. There are also four men listed on the Memorial who are not on the War Roll. One of these is George Slade who had married and left the village but still had family here. (The fact his name is listed out of alphabetical order, suggests he was a late addition.) The other three are Robert Adam, Ronald Brakspear, and Leonard Groves. As part of this DVS WWI research project, Harry Clasper has compiled a revised War Roll which now includes more than 430 names of Datchet men who served during the war. How did they decide which men to commemorate on the WWI Memorial? Were all the soldiers born here? No. Only 14 of the 54 men remembered on the Memorial were born here. Were they all living here when they enlisted? No. Only 33 were resident when they enlisted. Of the 21 others, 11 were living, working or studying elsewhere, including one in Canada. Three had married and moved away. Three were from families who also had homes in London. Two cousins didn’t live here but had an aunt who did. And there were two whose only connection was that their wives moved here to live with family while they were away. Did they all have family living here? Most did; 49 of the 54 men had family living here during the war. Of the remaining five, Ronald Brakspear had been very involved with village life before he moved to Henley; Leslie Nugent had moved into Brakspear’s house; Leonard Groves had worked for Lionel Cust who designed the Memorial; Christopher Nichols was the local bobby; and Robert Adam was a gamekeeper, possibly at Ditton Manor. This suggests that the main purpose of the memorial was to honour the loved ones of families living in the village. Could servicemen only be recorded on one memorial? No, some of the men who are remembered on Datchet’s memorial are also remembered on memorials elsewhere. 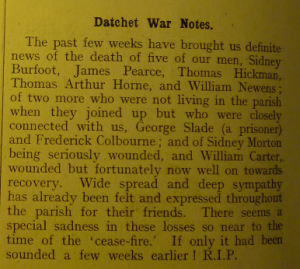 While researching the stories of Datchet’s soldiers, the Village Society discovered more than 30 soldiers with Datchet connections who are not remembered on the War Roll or WWI Memorial. You can view the full list of missing men here. Using the actual criteria which were used in 1920, the DVS believes that 11 of these men were eligible for inclusion on the memorial. Datchet Village Society has proposed that these soldiers’ names are added to the War Memorial as part of the restoration work, funded by the Barker Bridge House Trust, that is taking place for the centenary commemorations of the armistice. Joseph, a navvy’s son, was born in London. In 1901, age 14, he was working as an office boy but by 1911 he had joined the Army as Rifleman 7880 in the 2nd Royal Irish Rifles. At some point after his father’s death in 1906, his mother, Sophia, took a live-in job as a housekeeper for Doctor Norman Glegg in Queens Road. Datchet is listed as his home in Joseph’s army records (SDGW). Joseph’s battalion arrived in France on 13 August 1914, soon after the war broke out. Just over two months later, on 25 October 1914, he was killed in action at Neuve Chapelle. He is remembered, along with 13,416 other men who have no known grave, at Le Touret Memorial in France. He is perhaps not listed on Datchet’s Memorial because he had not spent much time in the village, although other men who hadn’t really lived here are listed. Or perhaps his mother was no longer working for Dr Glegg in the village, when names were being collected for the memorial? His home was Datchet when he enlisted which, according to the original criteria, would qualify him for inclusion on the memorial. Edward was born in Wexham and had four younger brothers. His family clearly fell on hard times. In the 1911 census, his father, a gardener, was homeless, and living in the open air at Dorney. Edward and one of his brothers were living at Tyndale House, a home for working boys in Chelsea. Edward had a job as a porter for a picture cleaner. Sometime after 1911, his parents moved to Welley. When Edward enlisted in the 1/7th London Regiment, he was living in Westminster. He was killed in action at Loos on 25 September 1915. He has no known grave and is remembered with more than 20,000 others at Loos Memorial, Pas de Calais, France. The Commonwealth War Graves Commission records that Edward was the son of Edward and Alice Ashton of Welley, Datchet Common. 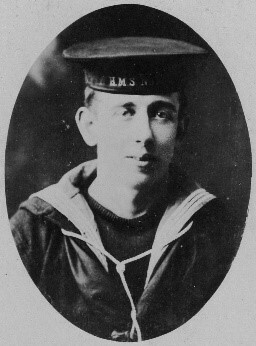 As Datchet was his family home, Edward should be a candidate for inclusion on the memorial. Percival was born in Horton. In early 1911, he was living with his mother, Johanna, and brother, Brian, at Welley, Datchet. He had three other brothers, James, Albert and Jack. All five men fought in WWI. Percy married in May 1911, moved to Maida Vale in London and started a family. He joined the Royal Navy as Stoker 1st Class SS/103275 aboard HMS Aboukir. He was killed in action on 22 September 1914 when his ship was hit by a torpedo from a German U-Boat in the North Sea. He is remembered at Chatham Naval Memorial. Percy’s brothers all survived but only one of them, Jack, who had also joined the Navy before WWI, is remembered on Datchet’s War Roll. Percy isn’t remembered on Datchet’s War Roll or Memorial perhaps because he had married and left the area but there are other men, who had done the same and who are remembered on the memorial because their families still lived in the village. His mother and brother, Brian, remained here throughout their lives. For this reason, we consider Percival to be a candidate for inclusion on Datchet’s War Memorial. William was born into a large family in Datchet. He appears to have been brought up by his grandparents at Chaloner Row (a row of tiny, overcrowded tenements behind Astracot on Horton Road). He joined the military in 1894 and served in the Boer War. Hardly a year went by without him being punished for committing some sort of misdemeanour, from refusing to get out of bed to breaking out of barracks. Back home in Datchet, he was charged more than once with drunkenness and assault. He stayed with his sister sometimes (at Wilton Cottages, Green Lane) but seems to have had no real home of his own. At one point he was arrested for ‘lodging in the open air without any visible means of subsistence’. William was recalled in 1914 and became a Driver in the Army Service Corps, serving in France, Egypt, Dardanelles and Salonika. He became seriously ill in April 1918 and was invalided home. 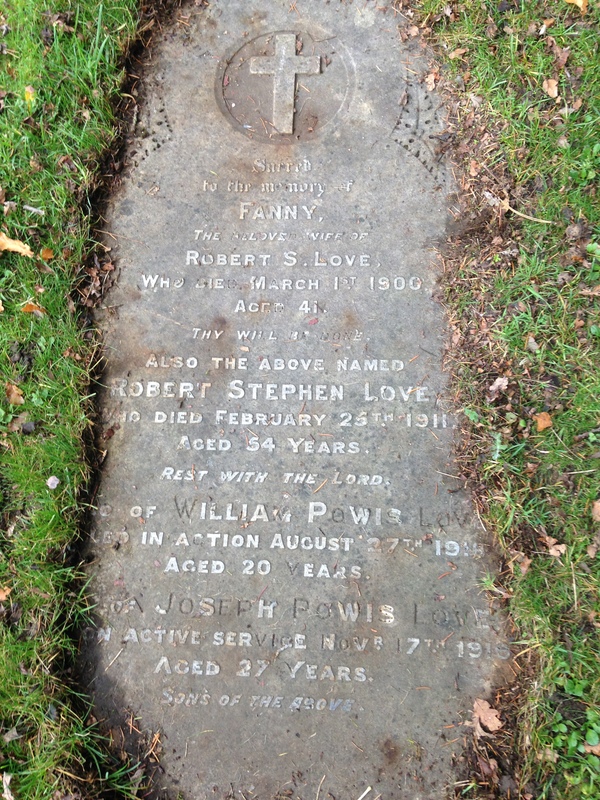 He died in hospital in Chelsea and was buried at Brookwood Military Cemetery, Surrey. He isn’t listed on Datchet’s Memorial. This may possibly be because his sister had moved to Old Windsor and wasn’t aware that a Memorial was going to be erected. He is considered to be a candidate for inclusion on the memorial because his home was in Datchet when he enlisted. Fred was born in Datchet and grew up here. He was a choir boy at St Mary’s and joined the Church Lads’ Brigade. As an adult, he was well-known as the clerk in the L&SW Railway parcel office in Windsor where he worked for 14 years. He married in 1915 and moved to Boveney where he had a son. His mother, a widow, had also been born in Datchet. She worked as a laundress. In 1925 she was living at 3 Elizabeth Place, Ditton Road. Fred asked to be released from his work (railway workers were usually exempt from service) and in mid-October 1918 he joined the Machine Gun Corps. Very shortly after enlisting, probably during his training, he caught flu and died in the camp hospital at Rugeley on 1 November 1918, just days before the end of the war. He was buried at Eton Wick and is remembered on the Memorial Gates, Eton. 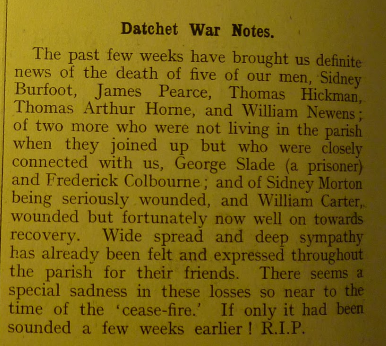 Fred’s death was reported in Datchet’s Parish Magazine at the same time as George Slade’s. Both men were not living in the Parish when they joined up but were ‘closely connected with us’, it said. George wasn’t born in Datchet, as Fred was, but he had lived here and his family worked at Leigh House. George, like Fred, had married and left the village. George is remembered on Datchet’s War Memorial but Fred isn’t. As Fred was born here, had lived here, and had family here, he should be considered for inclusion on the war memorial. He had married and moved away but so had others who are remembered on the memorial. 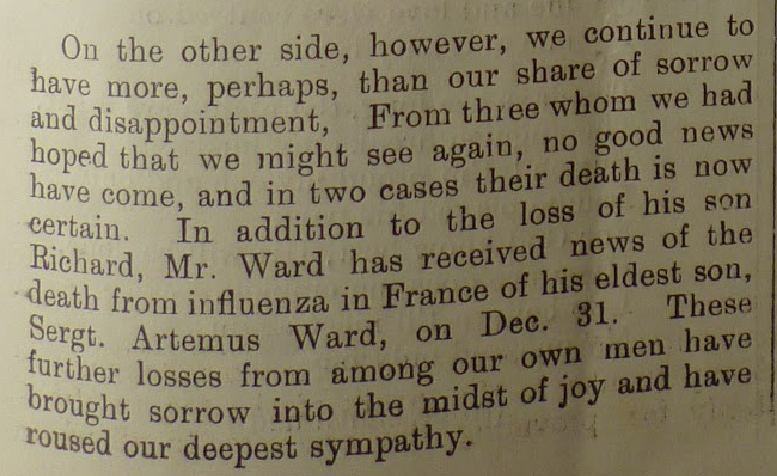 There are also others who died of flu rather than being killed in action. Harry was born and grew up in Datchet. His father, a gardener and later a carman, died in 1905 but his mother, a laundress, remained at Talbots Cottages until at least 1920 if not until her death in 1931. After school, Harry worked in the grocery trade. He started as a grocer’s porter in Staines, and by 1911 he was managing a grocer’s shop in Maidstone, Kent. He married Ellen Cooker in 1911. Harry later moved to Rochester where he enlisted in the 6th (The Buffs) East Kent Regiment. He was killed in action in April 1918, age 36. He was originally buried in Hennecourt Wood Cemetery then moved to Ribemont Communal Cemetery Extension, Somme. His death was reported in the Windsor & Eton Express, linked to Datchet Common. Although Harry was born in Datchet, went to school and had family here, he had later married and moved away. This perhaps explains why he is not listed on the War Memorial. There are other Datchet men though, such as George Slade, Ernest Clifford and William Wilkins, who did the same but who are listed on the Memorial because they still had family here. Perhaps Harry should be remembered too? Hamilton came from Croydon but was living and working in Datchet before the war. He was the manager of one of the village’s grocery shops so was probably well known here. He enlisted a few weeks after war was declared but he is not remembered on Datchet’s War Roll, or on the WWI Memorial. We discovered his connection with Datchet from the Croydon Roll of Honour. Hamilton became Lance Corporal, 16730, of the 5th Oxfordshire and Buckinghamshire Light Infantry (OBLI). He went to France in May 1915 and was killed later that year, age 27, on 25 September 1915. He is remembered at the Ypres (Menin Gate) Memorial. His brother George was also killed in action. Hamilton is probably not remembered on Datchet’s memorial because he had no family living here. He does, however, fulfil the original criteria set by the War Memorial Committee, that a man should be living in the village when he enlisted. William’s parents, Robert and Fanny Love, arrived in Datchet around 1895. Robert worked on the railway here and they lived at Railway Cottages. After Fanny died in 1900, Robert remarried. He died in 1911 and was buried alongside Fanny in Datchet Cemetery. Three of their sons, Thomas, Joseph and William, fought in WWI. (Thomas was mentioned in dispatches.) William, the youngest of the three, was born in the village and would have gone to school here. He must have signed up as soon as he was old enough. His military records (SDGW) indicate that he was resident in Peckham Rye when he enlisted in Maidstone. In May 1916, he was fighting with The Queen’s Own Royal West Kent Regiment. He later transferred to the Royal Fusiliers. He was killed on the Somme in August 1918 and was buried at Vis-en-Artois British Cemetery. William is remembered in an inscription on his parents’ grave in Datchet cemetery, which was probably commissioned by his brother Thomas. Datchet was his home village, where he was born, went to school and spent most of his short life, which makes him a candidate for inclusion on the memorial. Joseph was born in Battersea. He moved to Datchet, with his parents and older brother Thomas, around 1895. His father worked on the railway and they lived at Railway Cottages. Another brother, William, was born in the village in 1898, and both Joseph and William would have gone to school here. All three boys served in WWI; only Thomas survived. Joseph joined the 1st Battalion of the Oxfordshire and Buckinghamshire Light Infantry, the same battalion as his brother Thomas who was later held as a prisoner of war. Joseph served in India, was attached to His Excellency The Governor of Bombay’s bands, and rose to the rank of Staff Sergeant. He died in November 1919 in Malta on his way home from India for six months’ leave. He was buried in a military grave on the island. At the end of the war, the British Army had nearly four million soldiers to demobilise so it was impossible for them all to go home at once though most had returned home by the end of 1919. There were also peacetime obligations to fulfil so soldiers of the regular army remained until their period of service was complete. The fact that Joseph was coming home on leave suggests that he had joined the regular army before the war. Although brothers Joseph and William grew up in the village and went to school here, neither is remembered on the War Roll or Memorial. This was possibly because their parents had died and their brother Thomas was not in the village to put their names forward. 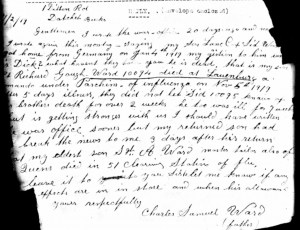 (Thomas was listed on Datchet’s 1918 Absent Voters List. He didn’t return home until December 1919 and then was living in Clapham with his wife and three children.) There is, however, an inscription in their memory on their parents’ grave in Datchet cemetery, see photograph above, which was probably commissioned by Thomas. The inscription dedicated to Joseph says that he died ‘on active service’. 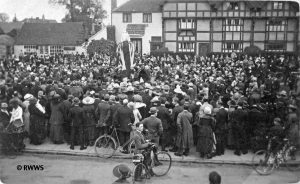 Joseph died after peace was declared but there is at least one other Datchet soldier, Ronald Stanley, who died of flu on active service in 1919 after the end of the war and who is remembered on Datchet’s war memorial. Joseph is also listed on the Commonwealth War Graves Commission website. Scottish-born Arthur had emigrated to Australia and was living in Queensland, working as a ‘motorman’ (the driver of a train or tram). He enlisted in June 1916 with the Australian Imperial Force, and sailed back to the UK, arriving in Plymouth on 10 January 1917. Just a few months later, on 29 April, he married Annie Jones from Datchet. Annie’s family had lived in Datchet from at least 1896. Her father, James Gentle Jones, a domestic coachman, had died in early 1909 and her mother took in boarders at their home on the High Street. Her brother Albert also served in WWI. Arthur and Annie had only been married a few months when Arthur, 29, was killed in action, in October 1917, by a high-explosive shell. In his records, his wife’s address was given as Elder Tree Cottage. Artemus was born in Isleworth. His family moved to Datchet sometime before 1893 and the 1901 census records the family in Penn Road. After working for a while as a market gardener, Artemus joined the Royal Munster Fusiliers in Ireland in 1903 and later transferred to the Royal West Surreys (RWS) as a Sergeant Tailor. He was married in Fulham in 1908 and by 1916 had six children; their different birthplaces provide an indication of where he was serving in the UK. Artemus’s death was recorded in Datchet’s Parish Magazine in February 1919, left. Artemus is perhaps not remembered on Datchet’s War Memorial because he had married and left the village but he still had family here. Nor is he remembered in Windsor where his wife lived. His brothers Richard and Sidney both served in WWI and were both taken prisoners of war. 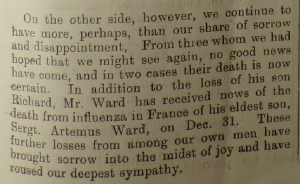 Sidney survived but Richard Gough Ward died of flu in November 1918 just before peace was declared. Richard is remembered on Datchet’s Memorial. Artemus Ward is considered to be a candidate for inclusion on the War Memorial. He had lived in Datchet and had family here. His brother Richard was remembered on the memorial. His brother Sidney was buried in Datchet Cemetery. Artemus still has family in the village who would like to see him remembered here.